Honeywell Dolphin 70e Black - Wi-Fi (802.11a/b/g/n), 2D Imager Scanner, Software Definable Radio (GSM + CDMA, Voice + Data), Android 4.0, 1GB/1GB SD Card, Bluetooth, Camera, GPS, Extended Battery, English Worldwide Version, USB power charger. Interface cables and charging cradle sold separately. You are the mobile workforce. You solve problems, make sales and even save lives. You love your smartphone but it hasn't been believable that the same device you play Angry Birds with can be reliable enough for your enterprise apps. Until now. 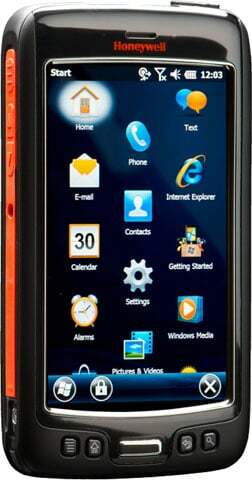 The Honeywell 70e Black is the perfect alternative for a mobile workforce that needs the mobility of a smartphone with a rugged enough design to handle real life applications. Dolphin 70e Black ChargeBase - US Kit. Four-bay terminal charging cradle. Includes US power cord and power supply. Dolphin 70e Black HomeBase - US Kit. Charging cradle with USB and auxiliary battery well for charging an extra battery. Includes US power cord and power supply. The Honeywell 70E-LG0-C122XE2 is also known as HSM-70ELG0C122XE2	or 70ELG0C122XE2	.